One of the most inspiring women of our age, Mary Robinson has spent her life in pursuit of a fairer world, becoming a powerful and influential voice for human rights around the globe. 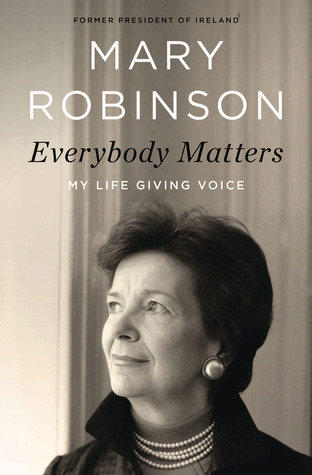 Displaying a gift for storytelling and remembrance, Robinson reveals, in Everybody Matters, what lies behind the vision, strength, and determination that made her path to prominence as compelling as any of her achievements. Born in 1944 into a deeply Catholic family—the only girl among five children—she was poised to become a nun before finding her own true voice. Ever since, she has challenged convention in pursuit of fairness—whether in the Church, in government and politics, or in her own family. As an activist lawyer, she won landmark cases advancing the causes of women and marginalized people against the prejudices of the day, and in her twenty years in the Irish Senate she promoted progressive legislation, including the legalizing of contraception. She shocked the political system by winning election as Ireland’s first woman president in 1990, redefining the role and putting Ireland firmly on the international stage. Her role as UN High Commissioner for Human Rights, beginning in 1997, was to prove an even bigger challenge; she won acclaim for bringing attention to victims worldwide but was often frustrated both by the bureaucracy and by the willingness to compromise on principle, which reveal the deep and inherent barriers to changing the status quo. Now back in Ireland and heading her Mary Robinson Foundation-Climate Justice, she has found the independence she needs to work effectively on behalf of the millions of poor around the world most affected by climate change. Told with the same calm conviction and modest pride that has guided her life, Everybody Matters will inspire anyone who reads it with the belief that each of us can, in our own way, help to change the world for the better.